A few weeks back I had to go to Fresno California for work. It was one of those dreaded last minute deals. Fly in early, fly out the day after. When I was looking at the map, I realized that Yosemite National Park was like a stone's throw away. Needless to say, I took the 4x5 in the hopes I got some free time! I landed, got the rental, drove to the press shop, did the press check (all was well, yay!) and drove straight to Yosemite in the early afternoon hoping on some good evening light. I was hoping on a first stop at Tunnel View but the crowds where just too massive for me to get out of the car and even bother. I was just flabbergasted by the insanity that is going on there. So I continued on my way. Exploring a little deeper. Driving through the park is such an amazing experience. I had never been so I gave myself ample time to look around. There's so much stunning beauty around you in that park, it's crazy. I understand now why Ansel Adams was so inspired by this place. The word 'spectacular' doesn't even begin to comprehend what I felt in this place. 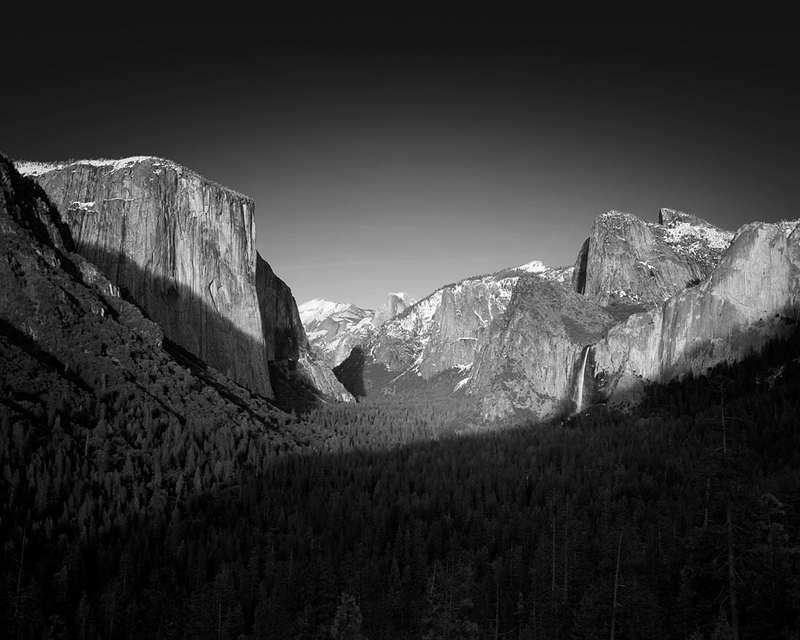 In late afternoon, I ended up back at the classic Tunnel View parking lot. Wow, the crowds where still there! Ugh. Just disgusting. There were about 50 other photographers there, all interlocking tripods, all trying to get their own famous shot. Just brutal! I debated driving away but then I noticed my friend, and fellow photographer Colleen Miniuk-Sperry. I've been supporting Colleen for a while now and I've always admired her unique eye. I parked the car and swung my pack on my back and walked towards her. Sneaking up behind her I said: "You know Colleen, Ansel would have never used a digital camera". She froze, turned around, and then saw it was me. We chatted for a bit about photography and both our future plans. After she was done she gracefully offered up her spot in the lineup. I was a bit hesitant but then I thought, I didn't came all this way for noting, so why not? So there I was standing in between photographers using the latest and greatest in digital gear. I heard nothing but shutters. One after the other. It was like the sound of a million mosquitoes. I wondered why they took so many succeeding photographs. I used to be like that. Now I know better. I took my viewing frame out of my bag. The guy next to me gave me a weird look. I started composing with my frame and heard some laughing behind me but I didn't care. Then I opened up the bag and grabbed the 4x5 and a 180mm lens. "Do people still use film?" "Can you still get that stuff?" "Ugh I remember those days, it was so hard to get a perfectly exposed negative". I smiled. Some photographers just don't get it. And started to set up the camera. A few minutes later, the low light became super dramatic, casting shadows all over the place. I was imagining the guy next to me to be Ansel. What would he have done? Then I heard somebody say "use the #25 Oli". I looked over my shoulder and there was my friend Ken Cravillion! Geez. You gotta be kidding me! I screwed on the #25 as suggested by Ken. Metered the light, made my composition and snapped two negs. I packed up and just like Colleen, gave my spot to Ken. That's what friends do right? I waited around for Ken to finish his photo. He shared his unique version of this place with me yesterday. Dang that looks amazing Ken! You are such a talented photographer! Take a look for yourself and tell me what you think of his rendition in the comments. After Ken finished up, about 20 minutes later, we were able to catch up for a bit. It was getting dark and I told him I was flying out tomorrow and had to get back to the hotel in Fresno. It was just such a whirlwind of a trip but I'm happy I've seen the scene that has made Ansel famous. I just finished developing the negative over the weekend and scanned it in on Sunday. Man what a beautiful sight. Super happy with how it turned out. That red filter was indeed the correct choice Ken.